One of the new shirt designs for the 2o19 walk. 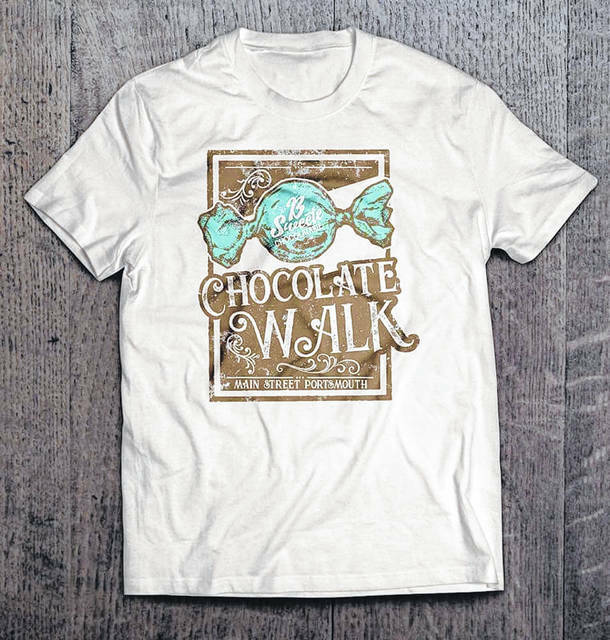 Main Street Portsmouth and over 30 businesses are preparing for the annual Ellen Vetter Chocolate Walk, which is set for February 9. While it can be a huge ordeal for businesses to prepare for 400 guests, Pratt said everyone who participates has a great time. “Businesses can really get into it. Last year, the Happy Pot was on everyone’s minds after Cinnamon did a very detailed treat themed around her pottery store. Also, newcomer Salon on Second was adored for their beautiful presentation. Over 30 businesses participate and say the day is a great way to show off their stores to members of the community,” Pratt explained. The Happy Pot is planning another fun attempt this year. Not only do restaurants and shops participate, but many other downtowners jump into the fun, including agencies and salons. The walk always begins at Port City Café and Pub, at 11 a.m., where guests check in and receive a map of participating businesses, as well as a handy Shawnee State University bag to store any treats they don’t want to eat the day of the event. Guests then have the remainder of the business day to walk through downtown, tasting chocolates and more along the way. Pratt also said the walk is celebrating ten years with a t-shirt for the walk. It is a modern and stylish design that features the namesake of Ellen Vetter’s legacy, “B Sweete Chocolataire,” the chocolate shop that started it all. https://www.portsmouth-dailytimes.com/wp-content/uploads/sites/28/2019/01/web1_choc1_ne201911814355708.jpgOne of the new shirt designs for the 2o19 walk.